Online MAT prep from MyGuru, like our MAT in-person tutoring, leverages the textbooks from McGraw-Hill or Barron's to guide instruction. However, we recommend eBook versions to build good habits for test day when a paper version of the test mot likely won't be available, since the exam is now administered in most cases on a computer. We begin with a diagnostic session to help create a manageable study plan, develop a customized curriculum that builds upon each student's strengths and weaknesses, and outline a calendar of drills that incorporates official practice tests to track progress. The Miller Analogies Test is a 60-minute test designed to examine an individual's capability to solve problems stated as analogies in order to buttress their qualifications for admission into graduate school. A MAT score is intended to reflect candidates' analytical thinking skills in various academic subjects. There are currently over 500 Controlled Testing Centers (CTCs) that administer the MAT and each determines its own testing schedule. In some cases an MAT score is an acceptable alternative to submitting a GRE score. Our base rate for online MAT tutoring of $95 is a slight discount from our in-person rate, and we also offer 5, 10, or 15 hour packages which come with discounts of 5, 10, or 15%. That's a long term rate of $95 × 85% = $80.75 per hour, so if you choose a 15 hour package, that's a total cost of $80.75 × 15 hours = $1,211.25. We believe that our approach to online instruction provides a more instructive and intuitive experience than anything else in the online test prep market regardless of price. After each session our students get two texts to review - their preferred MAT textbook and a digital copy of that day's whiteboard filled with notes and tips specifically tailored for them to refer to forever. Students only need a free Gmail or Skype account to begin instructive videoconferencing where both tutor and student can react to verbal and non-verbal cues making each lesson feel like it's being conducted in person. ...but students can also sign up for their own personal whiteboard, so they can use a pen tablet to work on problems live with their instructor and access all past sessions to review any problem they've covered at any time. 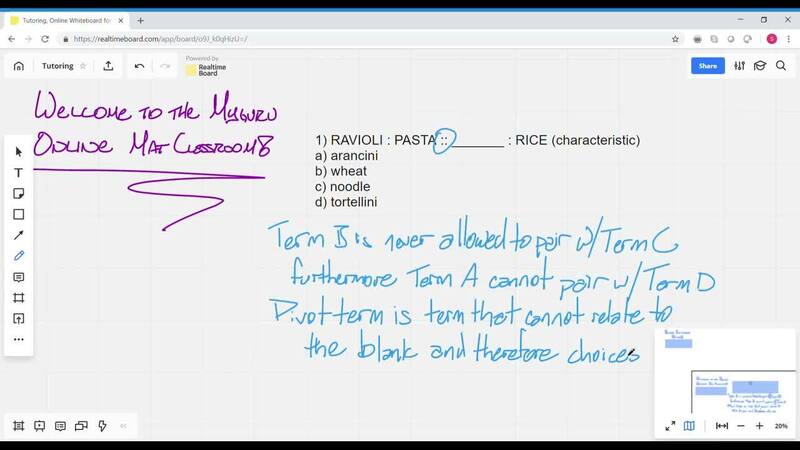 Most importantly, whether you choose your own or shared whiteboard, all MAT sessions are recorded as digital documents, so students can review lessons to reinforce concepts and approaches. ...and using a laptop with eBook materials eliminates the need to carry pounds of heavy books every time you want to study, which allows you to review content or even have a session anywhere you bring your laptop bag. For these reasons and more, MyGuru online MAT tutoring isn't just comparable to face-to-face tutoring, it's often better. To read more about our perspective on online tutoring click here. "Stefan is amazing at understanding my specific needs as a student with dyslexia. He takes the time to figure out the way I have interpreted a question and what exactly made that question difficult for me. Having worked with many tutors in my life, it was greatly appreciated that Stefan immediately knew how to accommodate me without having to spend a lot of time explaining my learning disabilities. From the moment I submitted an initial information request about MAT tutoring, the MyGuru team has been extremely prompt and helpful with their responses. I was immediately assigned a tutor and was able to begin weekly video chat sessions. Additionally, the whiteboard component has been a very effective tool in this process." - Diana K.